I don’t really know this man. 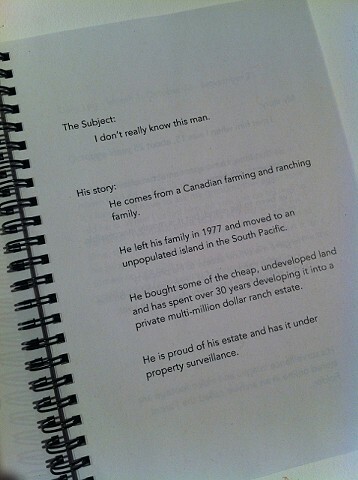 He comes from a Canadian farming and ranching family. He left his family in 1977 and moved to an unpopulated island in the South Pacific. He bought some of the cheap, undeveloped land and has spent over 30 years developing it into a private multi-million dollar ranch estate. He is proud of his estate and has it under property surveillance. I met him when I was 15, about 25 years ago. In that time, I have spent an accumulated total of one year with him. I’ve been to his island, but it is mostly inaccessible to me. He gave me online access to his property surveillance camera so that I can watch him on the land. I will observe him every day for one year. His surveillance images and video footage are stored online in an archive called the Parent Folder. 8.5" x 5.5" x .5"